After having a very enjoyable meal at Ratcliffe on The Green the previous night, the bar was set high in Charlotte. 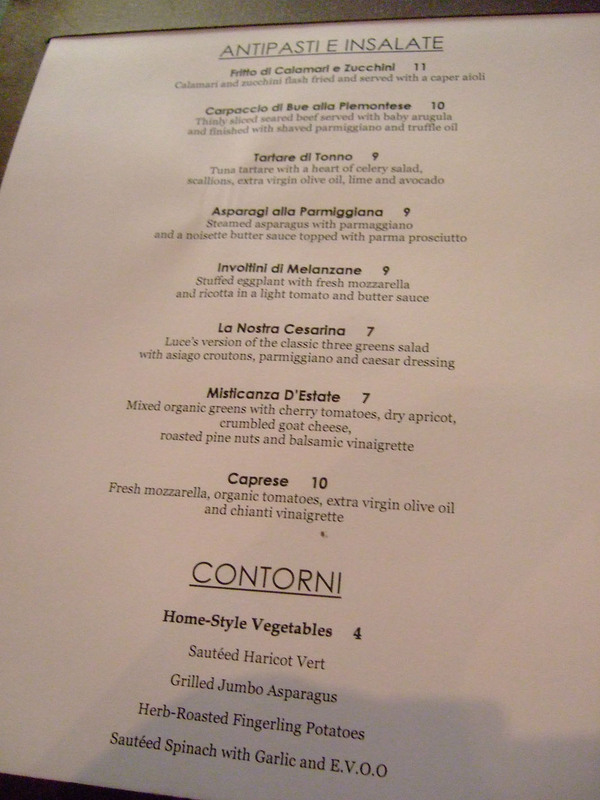 I wasn't sure exactly where we'd end up for dinner: along with Luce, other options were Arpa, Blue, Sonoma, and GW Fins. 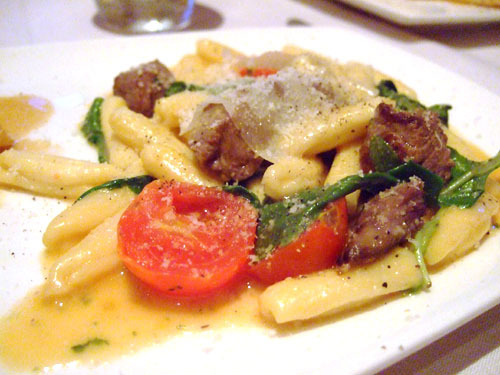 Some people were in the mood for Italian, and I'd heard some good things about the place, so Luce it was. 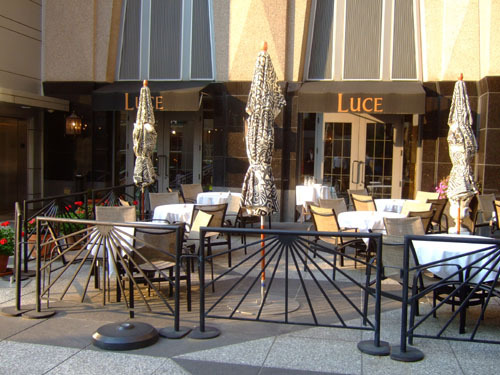 Luce has a nice outdoor seating area, but given the 100°F heat, we wisely opted to dine indoors. The interior is nice enough, though perhaps a bit uninspired. Our table afforded at least one of my dining companions a view of the NBA Finals game being shown at the bar. 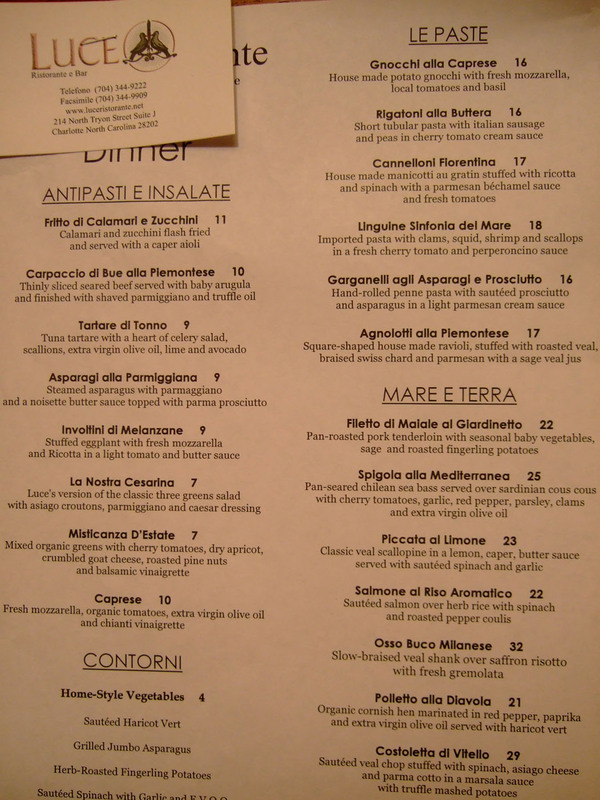 The menu is laid out in a straightforward manner: apps, pasta, mains. There are also specials, of course, which we did sample. Click for larger versions. I initially asked for a mojito, but sadly, there was no mint to be found. 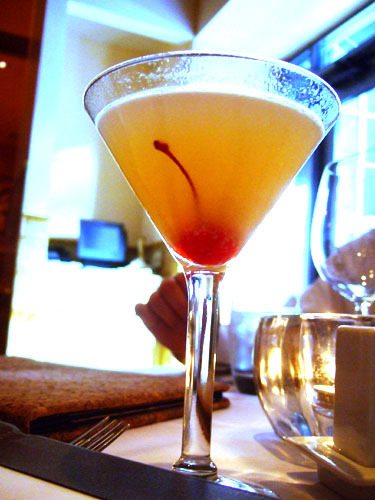 The Bellini Martini [$9.00] would have to do instead. I found it rather heavy in comparison to your garden variety Bellini, lacking the refreshing nature of the sparkling wine. By itself, the bread was decent but unspectacular. 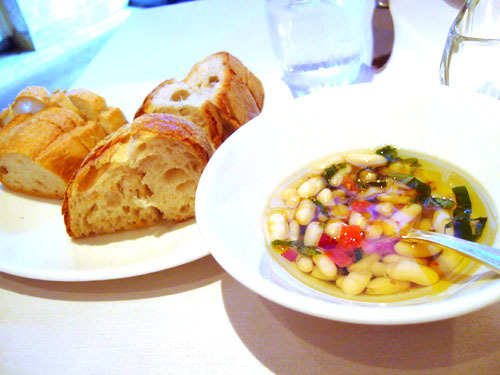 Paired with its olive oil-based dip however, and the bread was elevated to another level. Excellent. Stuffed Eggplant with fresh Mozzarella and Ricotta in a light Tomato and Butter sauce. This dish bored me; all I tasted was the eggplant, which I'll admit did have a somewhat unique crunch to it. But the two cheeses didn't really come into play at all. Overall, a disappointment. 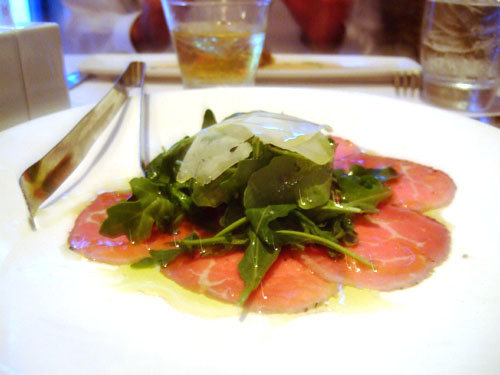 Thinly sliced seared Beef served with Baby Arugula and finished with shaved Parmiggiano and Truffle Oil. A very textbook carpaccio, but it worked well enough. The meat itself was quite tender, though not overly flavorful. The arugula and Parmiggiano did help to mix things up. Butternut Squash, Shrimp. 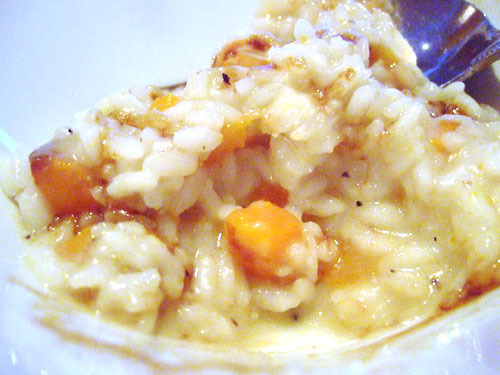 This was a competent risotto, but I felt the rice was a touch tough and the squash lent too much sweetness to the dish. 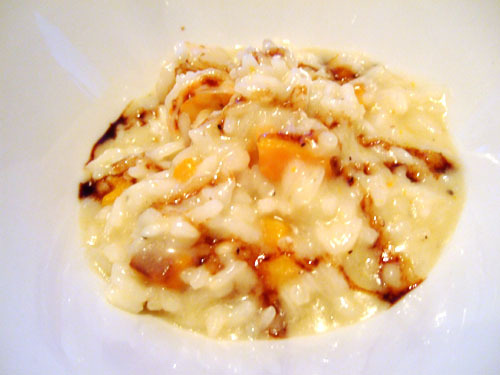 Solid, but pales in comparison to the risottos at places such as Patina. 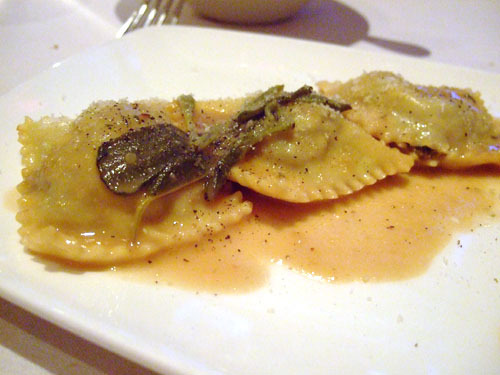 Square-shaped house made Ravioli, stuffed with Roasted Veal, braised Swiss Chard and Parmesan with a Sage Veal Jus. This was actually my favorite dish of the night. I don't usually find veal particularly flavorful, but the addition of the chard and sage to the dish really heightened the flavors here. Superb. Beef Tenderloin, Arugula, Tomato. Cavatelli is actually a pasta I don't see that often. They're normally made of flour, semolina, and water, and I found them to have a very pleasing, slightly chewy consistency. 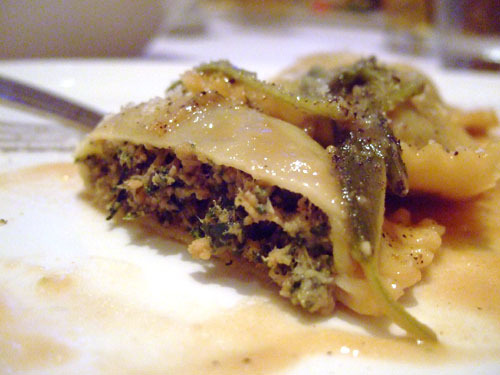 I thought this was a lighter dish compared to the ravioli, even with the tenderloin. The ingredients really stood on their own. Nice. 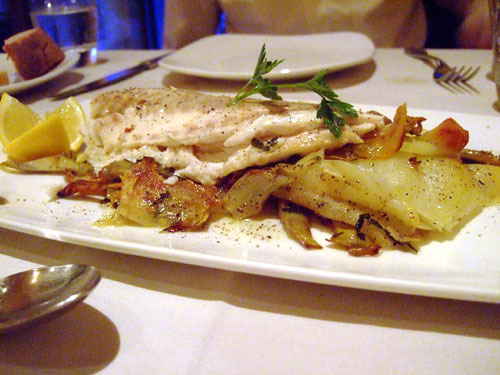 Also known as European seabass, the branzino here was served with potato and artichoke. This may have been my first time eating branzino, and I rather liked the fish, with a firm, slightly flaky texture bolstered by a sharp, salty tang. 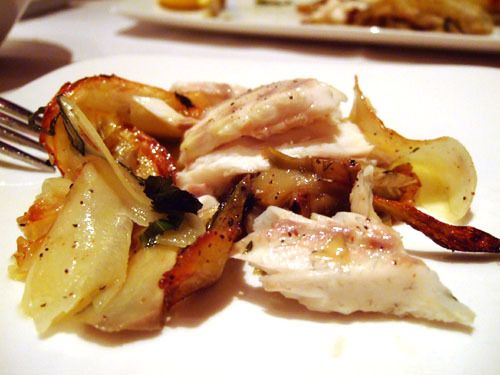 The branzino was especially good paired with and tempered by the potato. 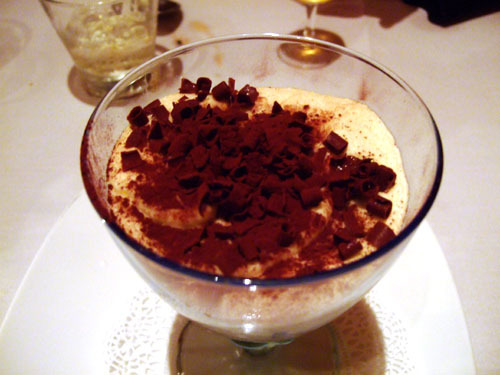 Ah tiramisu, the requisite dessert at an Italian restaurant I suppose. Not much to say about this one; it was delicious, but ordinary. Overall, I enjoyed my time at Luce. 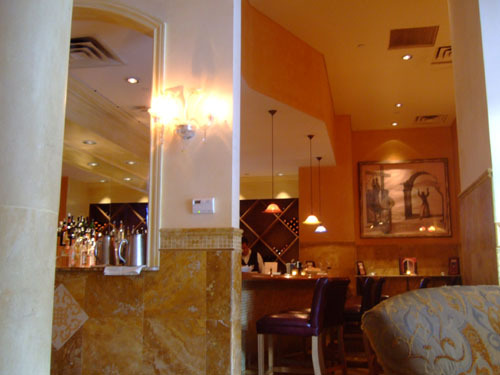 It's solid Italian, and a level higher than your typical Italian chains, though not nearly on the level of a place such as Valentino. 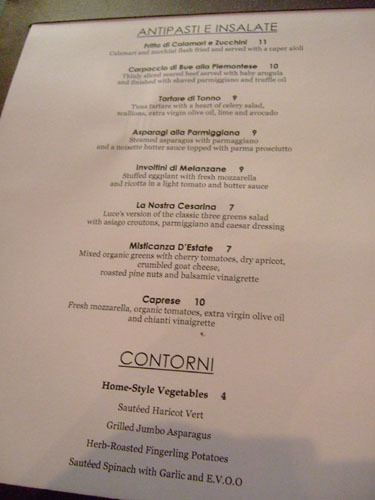 But no matter, Luce is definitely a solid contender to get your Italian fix in Charlotte. 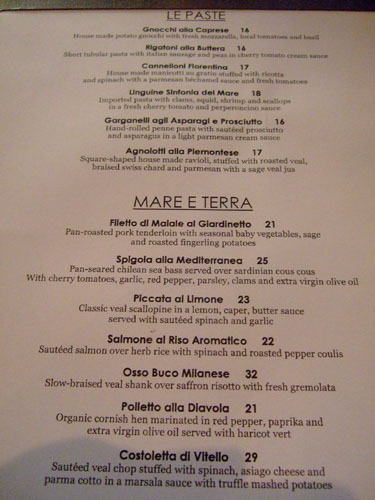 I rarely eat at Italian restaurants because of the Americanized version of Italian food so often offered. However, I found Luce to be a treat. When I was there, I enjoyed a pasta (can't remember the shape) paired with small cubes of potato and green beans. WOW. Unusual, delicate, and a show-stopper. A friend I was with was working on ravioli (she said they were good, not great) but she kept nabbing pasta from my plate. All told, I really enjoyed the meal there. As somebody who'd relocated from the Bay Area to Charlotte, it was a relief to find that the dining in the south is much much more than fried food and grits. The Bay Area is just about tops when it comes to restaurants, so I can imagine the difficulty in moving to Charlotte. Luce is solid as you said, while my favorite was Ratcliffe on The Green. 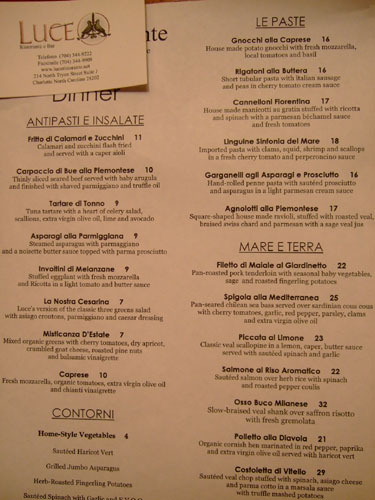 Great Restaurant review of Luce in Charlotte, NC. 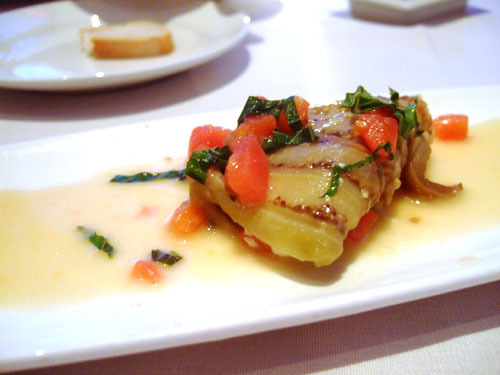 I am an Italian food fanatic, and I have tried almost every Italian restaurant in Charlotte. 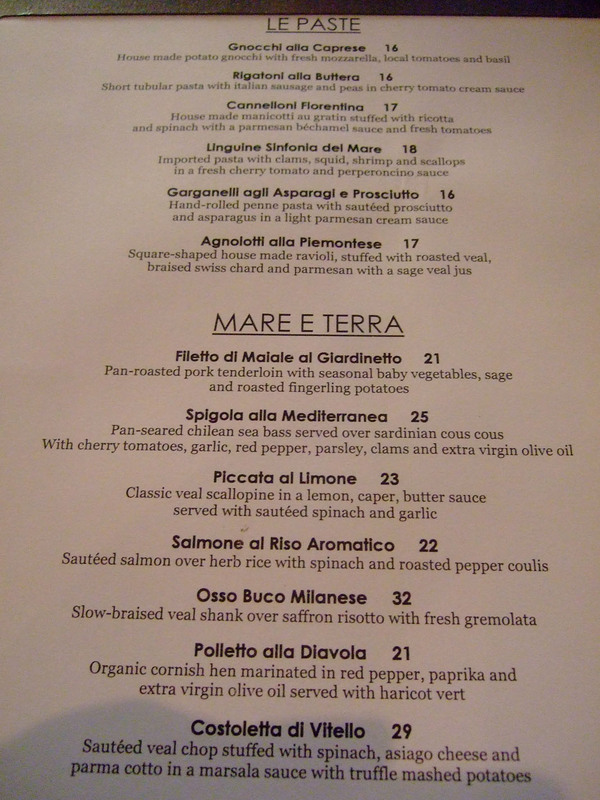 Recently, I visited Vivace Trattoria, and must say it is the perfect place to enjoy authentic Italian food. If you haven't tried Vivace then I recommend you give it a good try. I love all types of Italian food. 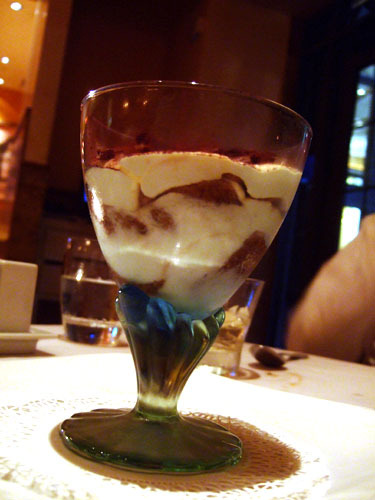 This looks especially good and when we are in Charlotte next month we will include a stop at Luce! Thanks for the article. We are headed to Charlotte this weekend. This restaurant looks great. We love Italian!